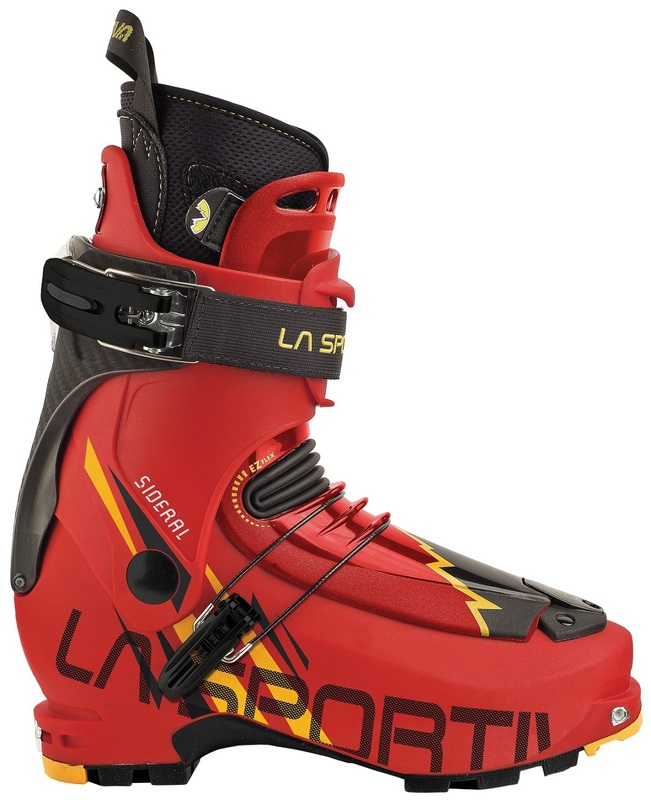 La Sportiva used decades of experience in footwear to create one of the most comfortable and functional ski mountaineering boots available. Testers report pain free forefeet and arches they didn't have in other brands and added warmth from the new insoles, just the things you want for those all-day tours. As far as functionality, a carbon-reinforced backbone and integrated Fast Lock closure system make for excellent skiability and one-motion transitions. The 68 degree range of motion and light weight will make you feel like running up the hill. Or save your energy and attach the optional power strap and spoiler and get after it on the down. Built in flex zones on the Paulau™ thermo-moldable liners have a patent lacing system to provide a custom snug fit. WarmSole™ insole prevents cold transfer through the sole of the boot, making these warmer than other thin-shelled lightweight boots. Optional power strap (22g/0.8oz) and spoiler (22g/0.8oz) included in the box for those more downhill oriented. Notes Flex zones, large range of motion, warm insoles, snug lacing, light and strong. Bottom Line Years of footwear experience equals most comfy fit for most. Is there a dealer for the La Sportiva Sideral in Bozeman, MT? Thanks! I have these boots and they seem to be a good entry-level rando race or skimo boot. The strap mechanism is very simple and functional, and you can unclip/reclip the strap without having to change the basic setting of the velcro. I haven't used the additional strap for stiffening, and they aren't especially stiff boots - but for my purposes this is not very important right now. The major complaint I have is with sole durability, which has purportedly been corrected in the updated version (which these appear to be). My soles aren't falling off yet, with low mileage, but I can see where they are starting to deteriorate. I've bumped my review from 3 to 4 stars in light of the fact that LaSportiva appears to have corrected the problem in the newer boots. With the La Sportiva Sideral how would you think it sizes up against Scarpa. I ski the Scarpa - Terminator X Pro now and have a 26.5 which fix great. Used to ski a Technica Cochise in a 27.5 which fit really well. I know I should go get a shell fit but wondering if you have any insights into this. Hi Mark, the Siderals have a similar fit to the Dynafit TLT series, meaning a tad short and narrow compared to a "beef" boot like the Cochise or an alpine boot. I had to go up a half size from my alpine ski boot size. However, given that you can fit into a 26.5/27 Scarpa shell, you probably won't need to size up past the 27.5. I would try that one first.